Maybe a monitor is just a monitor in many corporate work spaces, but in Silicon Valley and around the broader tech community, having the right desktop display is fundamental to the job. I run a mission critical team at one of Silicon Valley’s larger and better established companies that is a global leader in digital gaming, and we’ve learned with time and experience to take monitor and supplier selection very seriously. We need the size, shape and orientation of screens to suit engineering requirements and tasks. Connecting and adopting should be flexible, easy and tidy. We need a display supplier that has a broad product line, and people available to us who take the time to understand our needs, ensure we make the right choices, and then have our back for support and service. Like a lot of big tech companies, we have a hardware graveyard in dead storage that’s filled with bad choices — monitors ordered by different teams at different times through the years. They’ve all faltered, failed or just didn’t live up to manufacturer promises. We’ve learned, as most companies do, that display hardware selection requires a process and discipline. We don’t buy on price or PR buzz. Instead, we’re standardizing — and increasingly, we’re doing so with Samsung. We’ve developed a relationship with a supplier that can bridge affordability with very high-quality screens. Samsung has a product line that ticks all the boxes on what we need — from the multitasking of software engineering and QA, to the big canvases needed for everything from creative design to spreadsheets and timelines produced and used in administrative jobs. Big box stores thrive because consumers like one-stop shopping. That’s how we feel about our relationship with Samsung, where we can source displays for every use case we can imagine. That covers desktop needs as well as digital signage displays around the workplace, and even scheming a huge LED display into the main corporate presentation theater. We can get anything from desktop screens to interactive whiteboards to those super large new screens from a single provider. Big companies tend to like that one point of contact and one invoice, because it simplifies day-to-day operations. It also means if there are issues or questions, we know the right person to talk to, and he or she knows us and what we’re all about. The team I run spends its time testing and trying to break the code coming out of software development. Quality assurance can require a big visual canvas and a lot of source signals — many on a screen at once. We started a pilot program to see what would happen by switching from the four smaller monitors we tend to use now at each station — which eat up a lot of space and require a lot of cables — to a pair of Samsung widescreens. The widescreens have built-in keyboard, video and mouse (KVM) switches and we also use external KVMs, and we’re attaching multiple consoles through the DisplayPort and HDMI connectors. We look at a lot of things in testing, and by using the KVM switches, we’re able to quickly switch through a myriad of tests on applications and hardware compatibility, or watch analytic graphs or back-end server graphs. 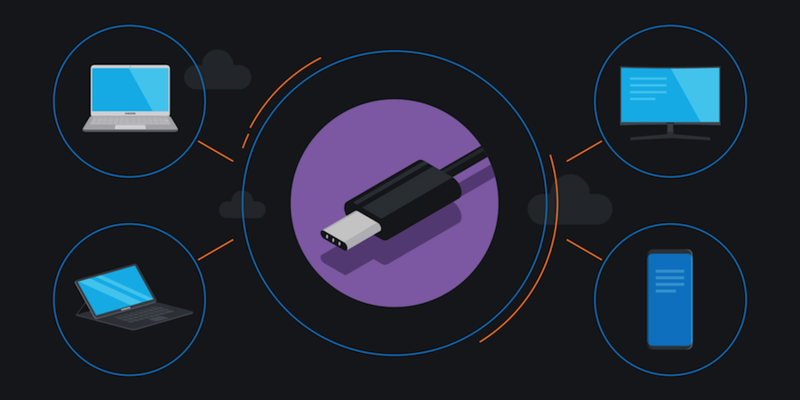 Learn how to clear desk space, streamline workflow and save time and money with USB-C connectors. It means my team members can really multitask — jumping between tests into email, spreadsheet or workplace collaboration windows — on the fly. It’s much faster and more efficient to utilize that sort of hardware setup. We’re using 43-in. ultra-wide monitors, but there’s an argument to be made for going even bigger. Samsung has allowed us to test its 49-in.-wide gaming monitor. My initial reaction, frankly, was to wonder who in their right mind would really need curved gaming monitors like these. After three months of testing, I get it. I want one. The screen real estate for multitasking is vast, and that kind of digital canvas allows users to really immerse themselves — whether in a game or an application. Working with a major display manufacturer has a lot of tangible benefits. The ability to get test equipment — not just see it in a one-day demo, but live with it for days, weeks or even months — is important. There’s also a lot of built-in comfort, because we know warranties are supported and after-care programs are the real deal, and not just sheets of paper. There are always cheaper monitors, somewhere, but if we just buy a bunch of screens off some online site, when a problem arises, it becomes our problem. That money’s probably gone, and we won’t really be able to do anything with malfunctioning or underperforming screens. With Samsung, we’re looking at paying a little bit of extra money for a quality product, but if something happens, we can get a replacement monitor in two days, and ship off the defective unit. That means we don’t lose much development or testing time. That really, really matters for tech companies working to tight, can’t-miss deadlines. Different tech companies have different needs and work styles, as do their teams. My group needs a big canvas for multitasking. Creatives may be fixated and demanding about color reproduction, refresh rates and pixel density. Programmers, more than anything, may just want a screen that can pivot to portrait mode so they can see more lines of code stacked on a screen. Desktop support teams — the folks tasked with keeping all this working — love monitor designs that tidy cluttered workstations and remove peripheral devices like docking stations. Having built-in KVW switches is nerdy, sure, but handy. So are USB-C connectors that remove the need for docking stations. Stuff breaks, and cables loosen. If they’re no longer needed, it’s equipment desktop teams no longer have to support, repair or replace. We’re in the midst of a process that has evolved from testing with Samsung to now rolling out more and more monitors — replacements and net new devices — across our enterprise, which inhabits multiple buildings and cities. Samsung has bent over backward to provide the product and expert insights to help guide evaluation and decision-making. It’s become a really solid working relationship that is more like a partnership than traditional vendor-customer ties. We like the big, diverse range of screen products that allows us to choose mainstream displays when that’s all that’s needed, but then select premium, super-flexible and visually stunning monitors when the job demands it. Samsung’s openness to get us the hardware to look at and play with for a while makes it so much easier to make business decisions. Instead of shooting from the hip and hoping for the best, it’s really nice when I start the process knowing what I get is going to be awesome. The author of this piece is a QA project manager for a global leader in gaming software. More and more enterprises are discovering the benefits of multimonitor usage in the business landscape. Download this guide on how to use multiple displays to drive employee efficiency in the workplace.